Waybill Tracking for Windows simplifies the day-to-day procedures that Freight Forwarders, Couriers, and Truckers deal with. This easy-to-use package has been in use since 1986 by freight companies large and small. With the optional Client Server Back-end, we can easily handle 1 to 100 users. -For years many of customers have been using our rock solid desktop application. Our systems handles everything from forms to EDI, to online customer portal information. - No double entry with our accounting API. We work with Quickbooks, Peachtree and other popular accounting softwares. It is as simple as a click away. 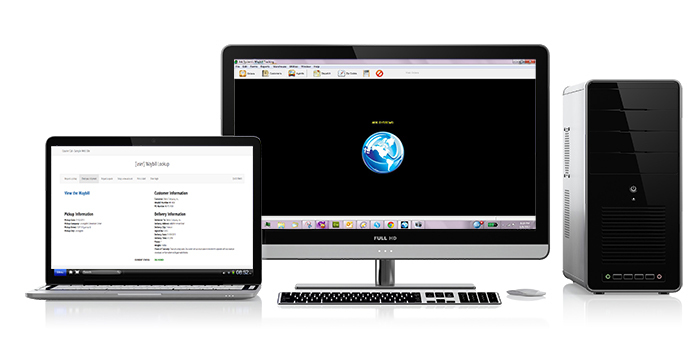 - We offer you your own virtual desktop in the cloud. Access your software from anywhere in the world, from any device. One-time $195 setup fee. Cancel any time with 30 days notice. Have a demo? Need more support information? Click on the icon above to go to pour support page. We highly recommend ARK Waybill Systems to anyone looking to use this type of system. The support team is highly knowledgeable and always available for assistance with any issues that arise. The training sessions are highly recommended, also one-on-one direct training helps to understand the processes and starts you in the right direction so you can grow your business fast! This program is easy to use, the more you use it the more you understand it. Waybill has made starting our new company easier, a big help! I like that you can customize it to suite your companies needs. Everett is very nice and easy to work with, he has been very dependable and on top of his job. He always returns my calls and has helped me with any questions I may have (even the dumb ones). Great customer support!! They don't drop the support once you purchase the program. Nancy Rootz Treasurer at JNR Transport Inc.